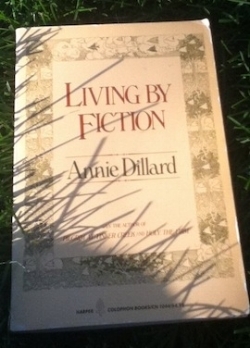 Annie Dillard is one of my literary heroes and that is the reason I pushed through Parts 1 and 2 of Living by Fiction (Harper Colophon, 1982) while reading it last weekend in a park under a blue sky. I knew if I did it would be worth it in the end. She would not disappoint. And let me say here, I do not place the blame for the necessity of "pushing" through the book's first two thirds at Annie’s feet. That portion of the book was about literary theory and critique, which somehow I missed in college while busying myself in biology and chemistry labs and have never quite caught up with since. Part 3, in contrast, posits one of the biggest of all questions in its title, “Does the world have meaning?”, and as we approached those final sixty or so pages we were off on the kind of mind-expanding, soul-soaring stretches of prose that made her my hero in the first place back in Pilgrim at Tinker Creek. “But what is knowledge if we cannot state it? If art objects quit the bounds of the known and make blurry feints at the unknown, can they truly add to knowledge or understanding? I think they can; for although we may never exhaust or locate precisely the phenomena they signify, we may nevertheless approximate them--and this, of course, is our position in relation to all knowledge and understanding. All our knowledge is partial and approximate; if we are to know electrons and chimpanzees less than perfectly, and call it good enough, we may as well understand phenomena like love and death, or art and freedom, imperfectly also."